Express Elevator--Hurry Up! 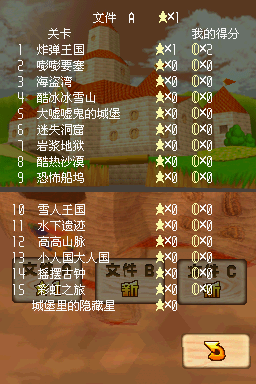 is the fourth mission of Wet-Dry World in Super Mario 64 and Super Mario 64 DS. The mission's objective is to collect the Power Star in the elevator shaft. In order to obtain this Power Star and complete the mission, the water level needs to be at its lowest point. 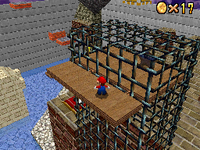 The player first needs to destroy the Block covering the hole at the bottom of the elevator shaft, though the Block is absent in the DS version. Afterward, the player needs to reach the third tier of the uptown, which can be reached by using the Heave-Ho on the second tier. Once they are on the third tier, the player needs to head to the elevator shaft, press the Purple Switch next to it, and use the platforms it creates to reach the top of the shaft. The player then needs to step onto the elevator panel opposite of the Power Star, causing it to drop, and then jump off the platform down to the hole of the shaft at the bottom, Ground Pounding to negate any fall damage. Once there, the player needs to quickly Wall Jump or Backflip or climb onto the interior of the platform before it rises up again. By riding the platform as it moves up back to the top of the shaft, the player is able to collect the Power Star. In Super Mario 64 DS, if the player is playing as Luigi, they can use his Power Flower ability from the ? Block on the fourth tier of platforms to turn invisible and simply phase through the top of the shaft to reach the Power Star. Spanish Ascensor expreso:¡date pisa! Express elevator: hurry! Ascenseur express-On se dépêche! (DS) Express elevator! Italian Ascensore espresso - Affrettarsi! Express elevator - Hurry! This page was last edited on December 20, 2018, at 09:15.